-If you do not already have an Amazon account, click here. On the left side of the screen, choose United States. 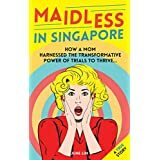 Maidless in Singapore: How a mom of four harnessed the transformative power of trial to thrive... A True Story.